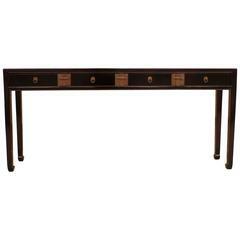 A simple and elegant black lacquer console table with seven drawers and brass ring pulls, beautiful color, form and lines. 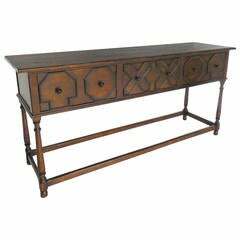 We carry fine quality furniture with elegant finished and has been appeared many times in " Architecture Digest " magazines and sold to many to celebrities. Last "Two Photos" are examples of our furniture appeared in AD and the table sold to Brook Shields' home. 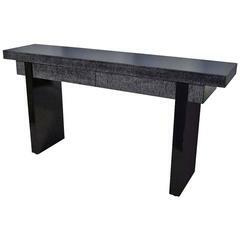 Bamboo console table with black lacquer top with two drawers. 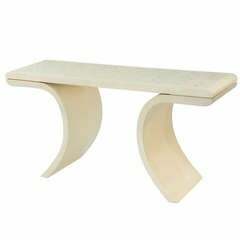 Sculptural console table in ivory lacquer with faux bone lacquered top in a chevron pattern, American, 1970s. Custom created by English cabinet maker, this console has an ebonized wood frame with tapered legs and three functional drawers with vellum covered fronts. Brass hardware. 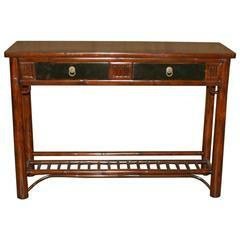 19th century French patinated wood console with black lacquered top, 1890s.